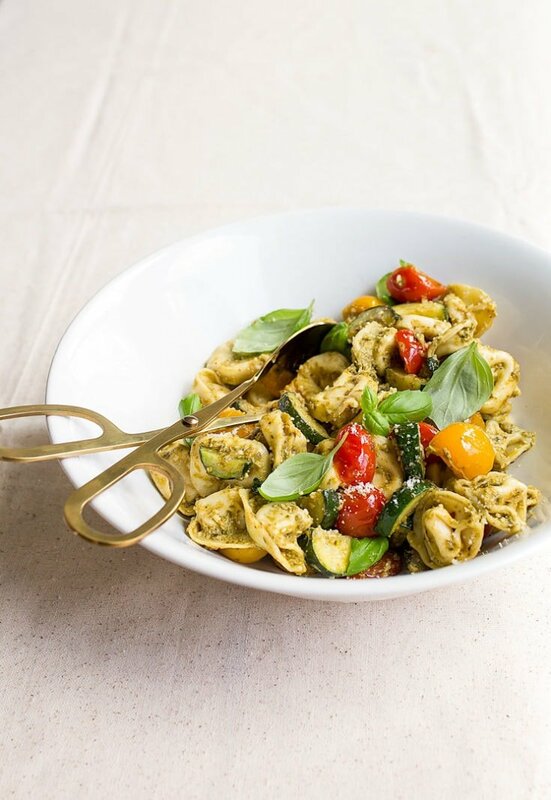 Pesto Tortellini Pasta Salad is an easy 10-minute summer dinner for two. When I’m lucky enough to get invited to a barbecue, potluck, or some other type of food-related gathering, I always hit the side dish table first. Barbecue ribs are great and all, but I’m here for the carbs, please. You’ll find me loading up my plate with all of the pasta salads drenched in vinaigrette (both creamy and oil-based are welcome, in my book). Pasta, cheese, and vegetables–it’s a complete meal, if you ask me. Why pasta salad gets relegated as a side act and never the star astounds me. But, the good news is, in the comfort of your own home, you can make and eat pasta salad as a main course! I serve it hot when I make it like this (your choice, though), and it’s so easy to pull together! The ease of this recipe makes it perfect for date night. 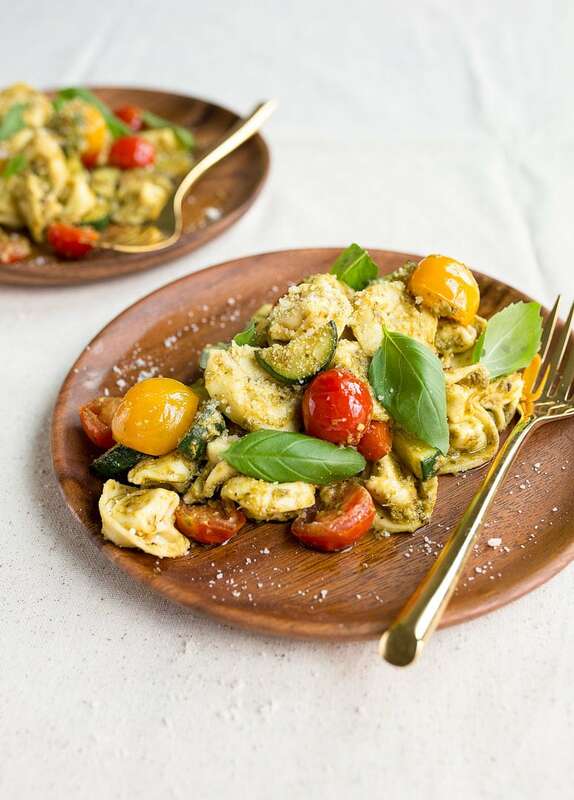 The sauce comes together while you boil the tortellini, and after a quick toss in store-bought pesto, you have another addition to your romantic meals for two at home repertoire. 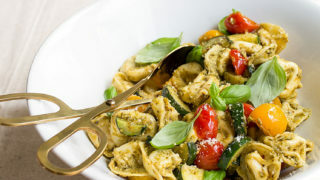 I always have cheese tortellini in my freezer, and my garden is overflowing with zucchini and cherry tomatoes currently. You can absolutely make this dish in 12 minutes while your significant other opens the wine and sets the table. I love these quick pasta dinners that come together in less than 15 minutes But hey, save the recipe and double it next time you need to bring a side dish to a summer party. It’s a great vegetarian side dish! I made you a quick little how-to video for this pesto tortellini pasta salad recipe. It lives in the top right corner of my site, but let me know if you have any questions! Pesto Tortellini Pasta Salad for Two. Bring a large pot of salted water to a boil. Add the tortellini and cook according to the package directions. (They usually cook in less than 5 minutes). Meanwhile, heat the olive oil in a large skillet. Add the sliced zucchini and let the first side brown a bit in the oil. Add the red pepper flakes and cherry tomatoes. Cook until the tomatoes start to wilt and release their juices. Drain the pasta and add it to the pan with the vegetables, and toss to coat. Move the mixture to a serving bowl, and stir in the pesto and Parmesan cheese. Serve with extra Parmesan cheese and fresh basil leaves. I love tortellini but never thought to make a salad! Great idea! I made this and it was delicious. I agree with you about pasta salads – why are they sides when they are so good?! I absolutely love pasta and will eat it any chance I get. I love how quick and easy this recipe is. I will be making it a lot. Had this as a side dish to some chicken kabobs. It was perfect!!! Thanks for a great simple recipe! Looks so yummy! Where are the gold tongs from? Love!